1 Can I check out of the apartment? 2 Where to check out of the apartment? Need check out of the apartment in theory It can occur in any person. The reasons may be different: Property For Sale, crossing, Care for military service, eviction by court order and other. Can I check out of the apartment? Yes, legislative restrictions exist, However, the relevant authorities may require proof of the possibility of subsequent registration, if a person, eg, minor children. You may experience problems with the extract in the presence of rent arrears. The procedure is free of charge. Additional costs may be associated with registration of notarized power of attorney in case of need. Where to check out of the apartment? Usually discharge procedure is carried out bodies of the Federal Migration Service, worn by the common name "Passport Office". Often for the convenience of its representatives are located in ZhEKe. SET statement copulating sample. Issued in the passport office. Filled on the spot. Bring the original document, identity. Usually this passport. It can be stamped on the relevant page of the stamp, confirming the removal of a person with a permanent address registration set. Men are required to provide military ID. Documents in the apartment. The contract of purchase of an apartment or technical and cadastral passport, usually, Do not ask. But it will be necessary to pre-order an extract from the house register. Staff housing department is preparing it for a few days, It contains information about all the people, who are currently prescribed or have ever been prescribed in a residential area. Help the absence of rent debts. Ordered in ZhEKe. Notarised power of attorney is needed in order, who can not personally come to the passport office, to write an application. To act by proxy, representative must be in possession of a document, identity. Advance the FMS agencies need to clarify, possible option if the proxy representation is whether another branch. For those, who have minor children, It may be relevant issue of training certificates of deposit payment for a new apartment, where are they going to do to register and register their children. If we consider the case, when a new property is not bought, but simply carried out the move, eg, to relatives, It may require the written consent of relatives in such a move. To unsubscribe from the apartment automatically, enough to come to the passport office, referring to the new place of residence, and apply for registration. During this procedure, the employees of this company have gone to a formal request under the old place of registration, that person was discharged. If all documents are in order, three days later in the passport will be stamped on the removal of persons from the registration accounting. 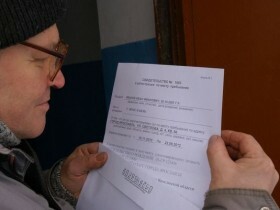 Besides, issued sheet form departure №7. All of this will need to provide to employees of the passport office in the new place of residence.